This story takes place in a dystopian, zombie-containing future but it is mostly about Melanie. She is a very smart girl but one that is just as naive, if not more than most children. But who can blame her? Her days are either spent in her room-like prison or in a prison-like classroom. She doesn’t know it herself but she is, of course, one of the zombies. The way she is treated is especially sad because she is such a realistic child. Despite her being a zombie and her childhood notwithstanding, she seems like a very recognizable normal girl even if she is far more intelligent than most children I know. Just like all children, she needs a parent figure and finds that in miss Justineau, her teacher. This leads to an interesting group dynamic as others don’t understand this bond. Before I started this book I wasn’t aware that it would be about zombies, though I’m not sure how I could’ve missed it. To be honest: I’m not really an expert on this subject. So I’m not sure if you can trust my opinion on this but I thought the virus itself was very original. It had a scientific explanation that (sort of) made sense and it wasn’t the simple brain-killing disease that even someone like me is familiar with. At times I almost felt the same as Caroline Caldwell (a scientist investigating the virus), wanting to know more and more about the zombies’ brains. That was probably why I found the chapters through her eyes the most interesting ones, also because she is a bit crazy. 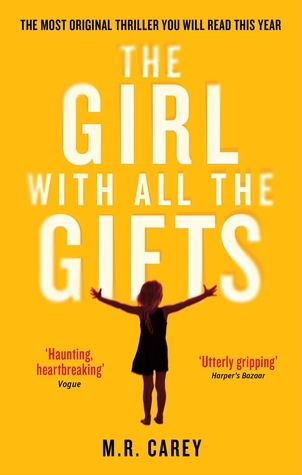 Even though the action scenes in this book are amazing, The Girl with all the Gifts is more character oriented. One of my favourite things about this book is that there were no good or bad people. My opinions about them kept changing throughout the story, but I did always feel like understood their actions and motives. Unlike many dystopian books, there is a lot of information about before the outbreak. Not just about the virus, but also the characters. They are still thinking of the past and their actions in the story show us that. They have made mistakes in their past and are trying to make it right, which affects the story. Especially for miss Justineau and Caroline Caldwell. The ending was bizarre. I won’t spoil anything, but days after finishing I was still trying to figure out if it was a good or bad ending. It was realistic without being predictable and it was a good conclusion to this amazing book. Besides the amazing action-packed scenes it’s still a story about a young girl with a bitter past, trying to adapt to her new reality and her relationship with miss Justineau. All this is why I highly recommend The Girl with all the Gifts, even if like me zombies keep you up at night.. I don’t think I’ve ever seen a single negative thing about this book! I really should pull my finger out and try to read it, especially with the movie release quickly approaching.